Jeanine Hill was born in Alcalde, New Mexico on a Pueblo reservation where she and her family were surrounded by vast orchards and high canyon walls. Her first exposure to the arts was early on when her father began taking photographs of the traditional Pueblo ceremonies by day and working with wood by night. She was taught the value of storytelling by her mother, who used words to shape the world. Jeanine's own making and storytelling practices were forged out of hours of being lost in the woods of Vermont and sharing stories with her siblings. Check out the link below for information on my new Kickstarter project. One Million Bones is a large-scale social arts practice. That means we use education and hands-on artmaking to raise awareness of genocides and atrocities going on around the world, this very day. The one million bones collected from across the country and installed on the National Mall offer a visible petition, to remember victims and survivors, to bring awareness to the issue and to call upon our government to take much needed and long overdue action. We suggest a donation of $5 for each bone created and for those not able to hand make a bone, we offer a “have a bone made in your name” option for $15. These funds go to three beneficiary organizations that provide advocacy and direct services on the ground. This is an important part of our mission, but our main focus is on making people aware of what’s happening in Sudan, the Congo and Burma, and providing an opportunity for them to take action in response. We never cease to be amazed at how many people have only the most vague notion of what genocide is, and how many more have no idea it’s happening now. All of us at One Million Bones think the most powerful thing we can do to change that is going to happen by using art as a means of introducing people to the issue and offering actions related to it. People of all ages and from all nations are invited to participate in this project. If you are interested in making or sponsoring a bone, please refer to GET INVOLVED. Visit www.onemillionbones.org for more information. 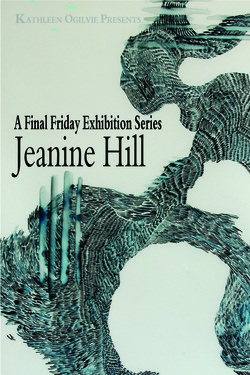 Le Cochon Noir is pleased to present the Final Friday Exhibition featuring work of Jeanine Hill. The work that will be presented is a culmination of abstract sculpture and drawings, both of which explore the experience of landscape and experience as landscape. Whether you come during the excitement of the Artist's Reception or find a quiet moment to enjoy enjoy the openness of the gallery space, the work presented will offer you a deep look into the practice of an amazing contemporary artist. Please join us for the Reception on Friday, January 27th from 6-8pm. Visit our website www.kopresents.net or join us on facebook at Kathleen Ogilvie Presents... for more information.